I love apples…crisp and juicy, sweet and tart, green or red. I eat one daily, sometimes with peanut butter or almond butter… I even add a few raisins and some cinnamon now and then for a special treat. 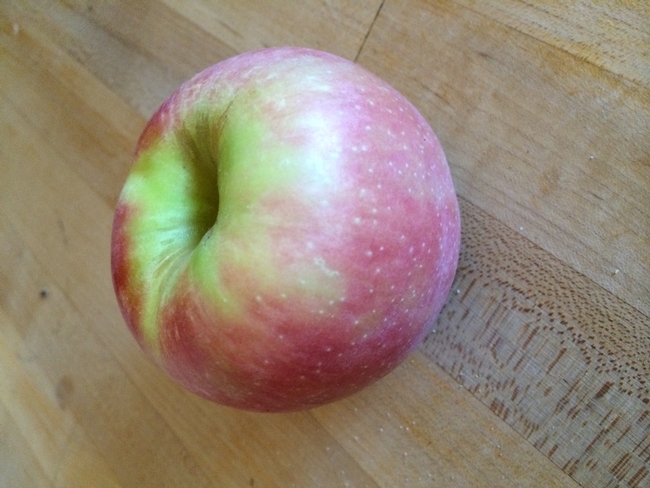 I have four lovely apple trees in my yard – Pink Lady, Honeycrisp, Arkansas Black and a Yellow Transparent Apple that someone was going to take to the dump because it wasn't what they wanted. I couldn't bear the thought of a perfectly good apple tree going to the dump, so I planted it and, I have to say, the apples are tasty and early. With so many apple trees, you would think I could satisfy my apple appetite. And, though I have gotten a few over the years, mostly what I get is tasty chunks after I carve out the coddling moth damage. Ewwww. So, this season, I decided to take action, enough is enough. I water, prune, and dutifully spray these trees…I really should get something more in return. My winter time research left me daunted – traps and pheromones, recording temperatures and sheesh – too much for someone who likes to keep it simple (you can translate that as “lazy”). 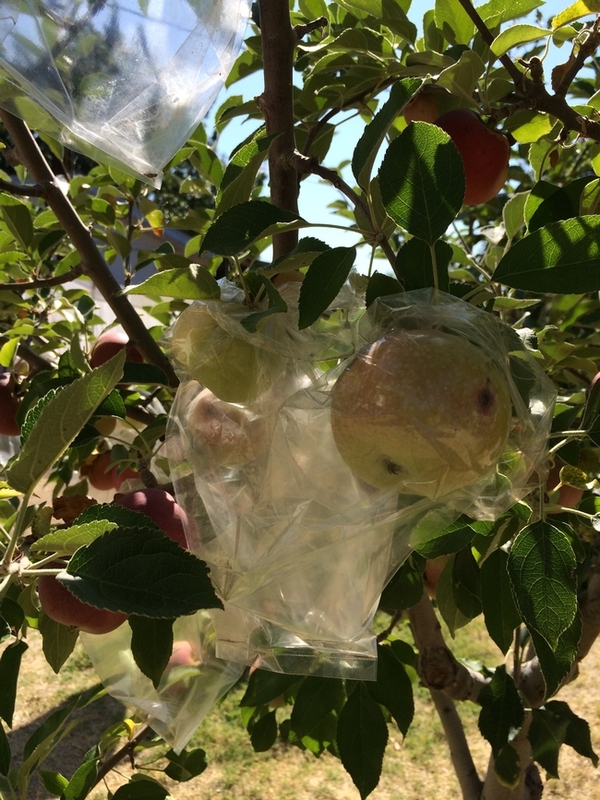 So, I remembered my trip to Japan some years back where I paid $6 for an apple (I really wanted one) and realized why they were so expensive when I saw workers in the orchard lovingly placing bags on each apple to prevent insect damage. No wonder those apples looked so perfect and cost so much. With that idea in mind, my Internet wanderings led me to apple bagging. I found a wealth of information, including video how tos. Seems I am not the only one who thought of this, in fact, lots of growers, backyard and commercial organic orchards are on board. There are even a number of sources for bagging materials of different kinds. There is even an added bonus for embracing this technique. Not only does bagging prevent coddling moth, it can help prevent other apple pests and problems … all without pesticides, fungicides, spraying and other rather bothersome tasks. This practice is most commonly used for apples and pears, and can help guard against such threats as codling moth, curculio, apple maggot, apple scab, and other impediments to a quality harvest. Bagging may even help deter birds and squirrels. Not surprisingly, various types of bags are now being used to protect other types of fruits, from bagging date palms in Egypt, guava in Pakistan, or mangoes grown in India and China. In the US, gardeners in Wisconsin have been tying paper bags around bunches of grapes for decades. When it comes to worthwhile organic techniques, bagging apples is a great one to try. In Seattle, pantyhose footies are given away by the non-profit CityFruit organization, so more people can grow high quality apples without pesticides. For maximum effectiveness preventing codling moth and scab, the footies are swirled in a mixture of water and kaolin clay before they are slipped over the thinned fruits. Bags made of paper, netting or other materials are less effective (and more unsightly) compared to plastic bags or hosiery sleeves. I decided to give it a try, however, since this was an experimental effort, I was determined to use what I had on hand and to try not to bag more than a dozen apples per tree. Why go all out if it might not work, right? The process begins with thinning your apple crop, that is, keeping one baby apple in each cluster. I always thin my apples (same for my grapes). The yield is less, but the apples are bigger and the tree is healthier. Per my research, I thinned my apples and when they reached about half an inch in diameter, I bagged them. 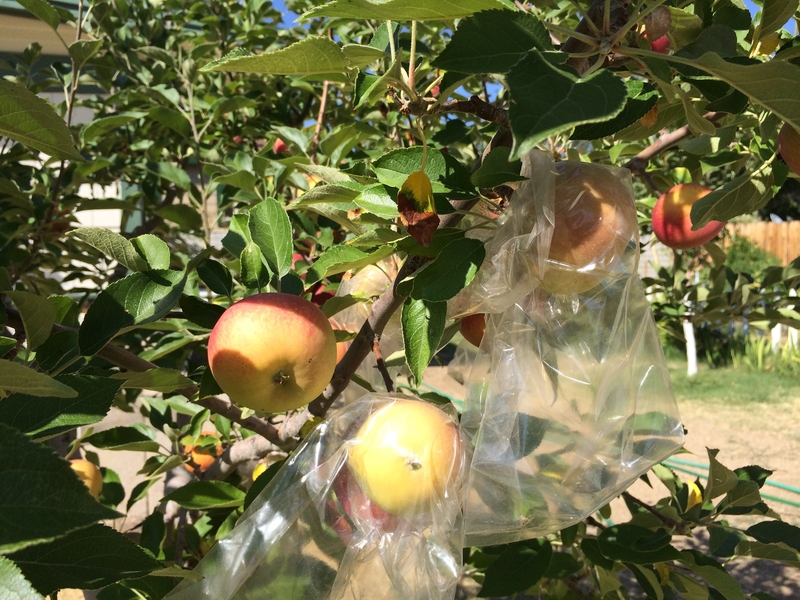 There are a good number of options for bagging – lots of bagging supplies to buy from Internet resources, including bonafide Japanese Apple Bags. And, there are lots of folks who use resealable plastic bags or nylon stockings (really!) I happened to have small (6”x8”) plastic bags (not zip lock) that I use for baked goods and backpacking. They seemed to be a good size for apples, so I used them and fastened them with a twist tie. It didn't take too long and kind of made me chuckle. A real conversation piece when company came by. Over the summer, I kept my eye on them. With the heat, some moisture collected in the bag, and some articles suggested cutting the bottom corners to let the moisture drain. I decided I didn't want to risk insects getting in, so I opted not to do this. In the end, it did not seem to make a difference. The apples grew and matured as usual. Some articles suggested removing the bags some weeks prior to harvest, I opted not to do this, also – didn't seem to make a difference. I did have to wait a bit longer for the bagged apple to take on their color. The proof of the pudding, so to speak, came a harvest time – though not all bagged apples escaped coddling moth – a few sneaked through the twist tie area (probably my bad) – I was excited to finally harvest and eat a good number of apples from my very own trees. In chatting with other Master Gardeners, I found that several had also tried this method, all with varying success. So, while it appears that this idea is not new in these parts, I found it to be worth the time and effort, and will definitely employ bagging next season. I do, however, intend to find biodegradable bags for the process. I have included resources and photos here. Now, excuse me while I munch my home-grown apple! There is an array of options when it comes to bagging fruits. Plastic resealable bags and brown paper bags can be used to protect your fruit and are readily available. Additionally, there are specialized Japanese fruit bags that can be ordered online, or nylon mesh bags that may be better to use for softer fruits. In most cases, the bags can be reused the next year! Inclusion does imply endorsement by the University. Other sources are available. These are a good place to start.